The Sto. Nino is one of the oldest and most revered religious images in the Philippines. 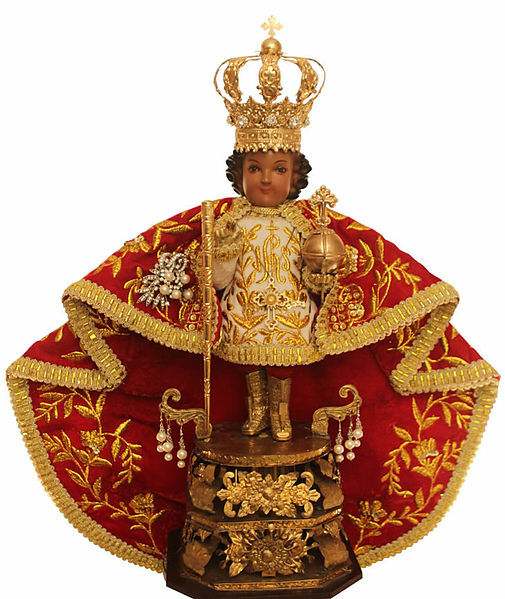 Santo Nino means “Holy Child” in Spanish, and is a representation of the child Jesus. This wooden figure is often dressed in an intricate and lavish red cloak, with a gold crown around its head, holding a scepter and the globus cruciger (cross-bearing orb). According to historians, when Ferdinand Magellan arrived on the shores of Cebu in 152, he offered the Sto. Nino as a baptismal gift to Hara Amihan (Queen Juana), the chief wife of Rajah Humabon (King Carlos). The acceptance of the gift also represented the native couples’ pledge of allegiance to the King of Spain. Legend has it that 44 years later, a volatile fire destroyed many villages and farms in Cebu. Looking around the burned villages, one Spanish soldier found a replica of the Holy Child miraculously unscathed by the fire. Because of this, the Cebuanos started to believe the miraculous image as the patron saint of their province – one to guide them and keep them safe in the most difficult times. This particular image has then been enshrined at the Basilica Minore de Sto. Niño in Cebu. There are many variations and images of the Sto. Nino, with festivals and parades to celebrate this devotion all over the Philippines. Some of the biggest celebrations are held in Cebu during the Sinulog festival, and in Aklan during the Ati-Atihan festival every third Sunday of January, the feast of the Sto. Nino. These festivals are usually lavish and last up to nine days. They typically include a religious procession, Mass, and a large street celebration filled with festive performances and colorful costumes. Many locals and tourists travel just to take part in these festivities, and of course, to be able to see the miraculous Sto. Nino. January is also known as the month of the Holy Child.